Hutch introduced new nonstop unlimited internet package for Hutch prepaid customers. Package name is Twelve to Six and valid between 12:00 A.M. to 6:A.M.(1 Night).This is very cheap comparing with other time based internet plans available in Srilanka. 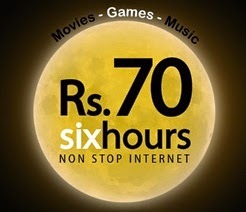 12 to 6 Hutch Nonstop unlimited internet specially designed for heavy downloading prepaid customers within the network. This hutch nonstop unlimited internet package valid six hours after the activation. Download speed can take 3.6 Mbps and upload speed up to 512 Kbps and Rs 70.00 charged for one night.Enjoy. How to activate Hutch unlimited internet data package ?